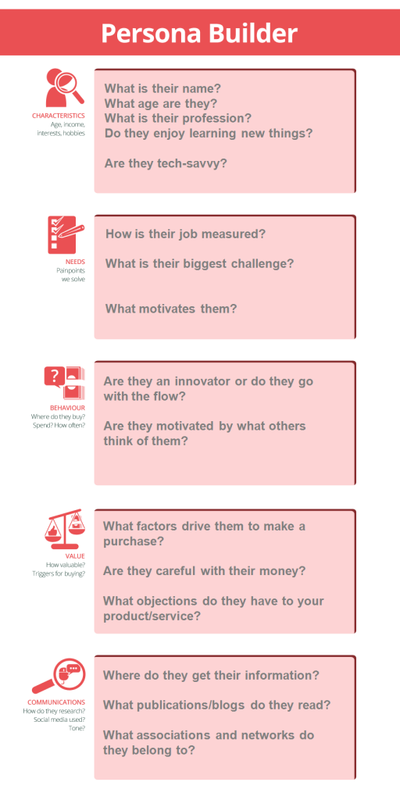 You’ve probably heard a lot about buyer personas for B2B marketing. Or customer focused marketing? Persona Marketing. Whatever you want to call it, there’s a lot being said about buyer personas right now, but what I find is that a lot of the ones we’ve come across are a teensy bit boring! And that is why I feel the need to share what kind of thing Brightspark produces. There is plenty of information in here, but are you really going to trawl through all of the text? How much of it do you think you will retain? A lot of work has obviously gone into creating this persona but it may not do what it sets out to, simply because it requires too much concentration. There is just too much information. We come up with a simple set of questions that are relevant to the client’s industry. We don’t believe in building out persona’s so much that they include all the detail on favourite foods, music, or anything non-work related. It’s important to know the basics, but then move on. Of course there are exceptions, but always ask yourself – is this information really going to help me understand how to convert sales? We live in a design world. Just because something will be used internally doesn’t mean it has to be microsoft word! 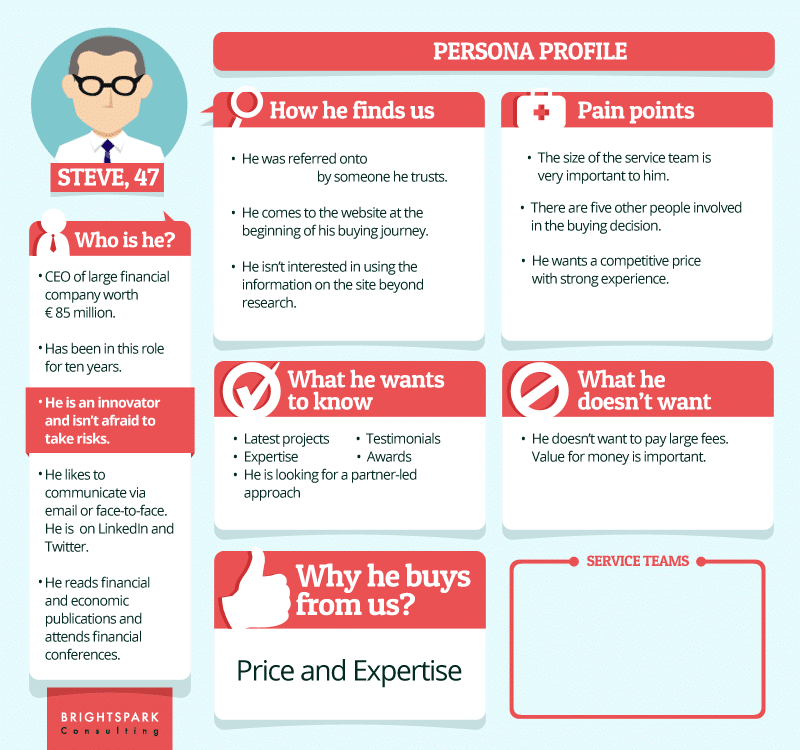 Our buyer personas work well because they relay the content in an easy-to-read manner. Don’t you a clear picture of who Steve is and what he wants, even with significantly less text? Hopefully if you’re on the client side, Steve will remind you of someone you know! Good questions at the beginning. Clever crunching of results. Design to convey meaning. And there you have it! Take the time to think about these two simple things and you will have more focused and relevant B2B buyer personas in no time. 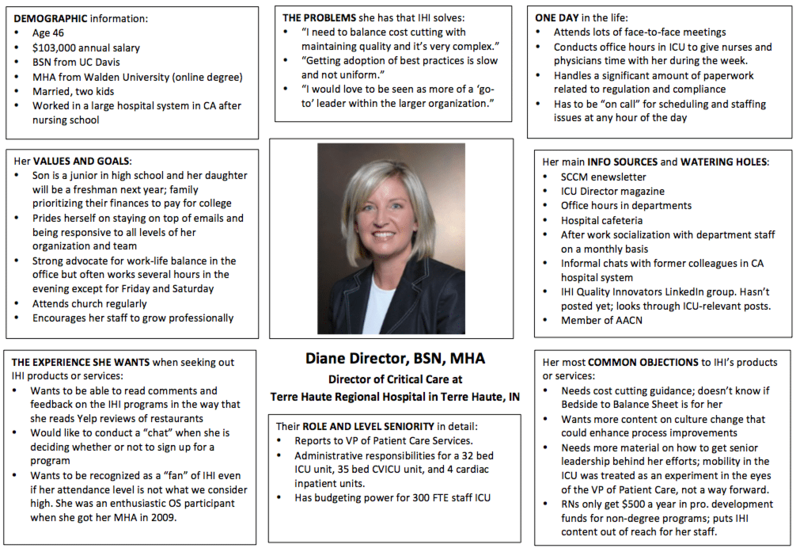 There’s a great online learning module on personas in our Social Media Training. I will guide you step by step to come up with your personas and to match them to the ideal platforms where you can find them online. « How Will Instagram Carousel Ads Look?